Cyber Matters: How Much Of Tor Is Used For Illegal Purposes? 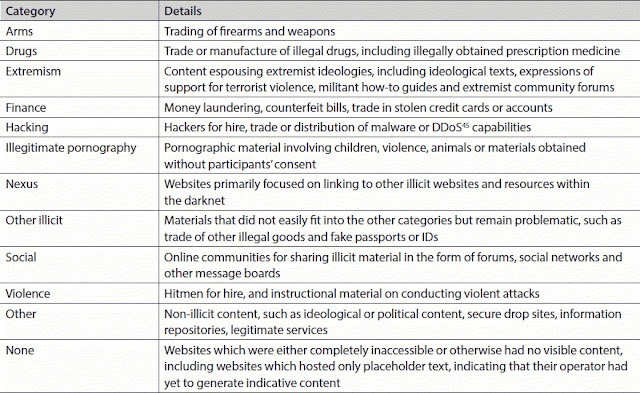 How Much Of Tor Is Used For Illegal Purposes? A paper just published by researchers at Kings College attempts to quantify how much of Tor is used for illegal purposes. Or rather, what proportion of Tor's hidden services are used for illicit purposes. These results were reported with what was termed a "high degree of confidence". Where sites were categorised as "None" it was because there was no content (hence counted neither as illegal or legal in nature), and "Unknown" means it was not possible to determine the nature of the content. Interestingly, Tor reports approximately 35,000 unique .Onion addresses. But the researchers report approximately 300,000 addresses having been detected, representing 205,000 unique pages (individual sites obviously comprise many pages). This suggests that the researchers' analysis does cover a statistically significant proportion of the hidden services in operation. Hence, the conclusion, which seems to be statistically valid, means that at least 57% of "active" sites were involved in illegal activities. Whilst many headlines have reported this as being the majority of Tor is used for illegal purposes, it needs to be remembered that this also means that 43% is being used for legal purposes. 57% is a relatively small majority. From this you can see that out of a total bandwidth in excess 150,000 Mbits/s approximately 1300 Mbits/s are used by hidden services ie less than 1%. It might be slightly erroneous to extrapolate numbers of types of user from bandwidth usage but I think it indicates that even if the "majority" of hidden services are used for illegal purposes, Tor users in general are not using the network to access these services. Of course, as hinted at in the first paragraph above, not all illegal activity on Tor will be limited to hidden services so there is perhaps further work to be done to analyse the destinations in general for those who use Tor to access the web.